Would you believe that it's eight years since Mandi and I started the challenge blog "Less is More". 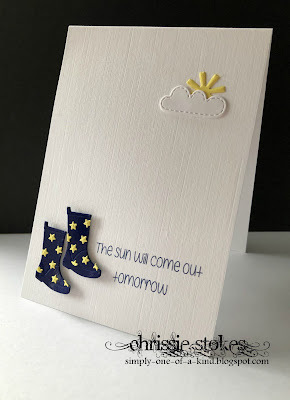 Both of us loved the Clean and Simple genre and there was practically nothing by way of challenges for this style of card to be found in Blogland. Lots of people were afraid of 'white space' and it was a journey of trepidation for many crafters, but today the genre is firmly established and for me it is still the most beautiful. We established many firsts with our challenge... as there were only 2 of us, submitters wouldn't receive many comments if left to us... so we asked that contributors to comment on each other's blogs... a trend that had been widely copied and enjoyed. We started giving tutorials for various techniques and this idea can now also be seen by others. Since I stepped back from running the Blog I have been delighted that others have come forward to continue the work which gives me enormous pleasure, it feels so good to see that the traditions are continuing. The card I have made for this birthday celebration is an echo of that very first challenge. It was also a colour challenge and I used wellies for that one too! Here is my card from 2011! Such was the interest in CAS cards in those early days, with little choice of CAS challenges, that there were literally hundreds of submissions every week and Mandi and I used to comment on every one... quite a challenge in itself! My card this time is a simply bunch of die-cuts with a computer generated sentiment. The boots were cut from shiny blue card with the yellow die cut stars added afterwards. The sun is actually supposed to be a flower die but looked about right and was just the right size to peek out behind the cloud. I have been searching to try to find out the make of the die-cuts but my filing system leaves much to be desired and at the moment the various makes of them escapes me! I am delighted to have been invited to join in with LIM once more... long may it continue! Gosh is it really eight years! I remember it starting but didn’t join in for quite a few weeks. CAS eluded me then! Love your sweet card. Nice to see you back on the blog...thanks for starting up this challenge, it is so fun to be part of this team! What a sweet card Chrissie. Thank you for making me aware of the whole LIM/CAS genre, I love it. I've just started writing the name of the manufacturer on the back of my dies with Sharpie, wish I'd done it sooner. Oh how fun you CASEd your first ever LIM card! Love the wellies and all the white space you left... Wonderful use of dies too! Thank you for joining the birthday festivities at LIM and thank you for starting this challenge blog that has brought so much joy to everyone in crafty blogland! Chrissie, your challenge made me try CAS way back when. I actually got pretty good at it, then I fell in LOVE it. I am so tickled and honored to have ended up here on the DT. I feel like you and Mandi had a big hand in my growth as a paper crafter. Thank you. Oh and I LOVE everything about your GD card. Thanks for designing with us gracing us with your creation. From little acorns, Chrissie - you must be so proud! Love that this week's card has echoes of your first one. Personally, I NEED those wellies in my life - how fab are they? !